Finally got myself something to knit and it's for me :) I decided to knit up a pair of these Blue Monday fingerless gloves using Knitpicks Superwash merino wool in Allspice. I found﻿ a matching ear warmer pattern to cast on in the same color once I've finished. Then I can be all matchy-matchy in the snow. I hope I actually wear them and don't find fingerless gloves a bit pointless. We'll see. They look cute anyway and the color will be perfect for next fall. I hope to get to the yarn store later this week to pick up some yarn to cast on a sweater for John Paul. I know he'd really like one and I've been putting it off in favor of easier (and less expensive) projects. But my little boy wants a sweater from Mama, and so, darn it, I'm going to make one...soon. And in order to get myself smarter, I began reading Walden by Thoreau. Yep. I really want to know and read more of the classics and I had no idea where to start. So I picked that one off of our shelf thinking I should probably read it rather than always 'somedaying' it. I'm going to be honest and tell you that I had absolutely no idea what this book was about, though I know it's a classic and constantly referenced in other works. None. I can't say my education in the classics was that thorough. I mean, I knew there was a pond and he lived alone...or something like that. It's, um, not really what I thought. He's a pretty wordy guy, that Thoreau. But I'm going to persist so I can feel smart and put some of these many books in our home library to actual use...and maybe get an extra Jeopardy question right or something. 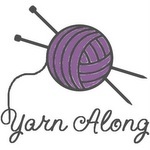 If you've got a minute, go on over to Ginny's and check out the other Yarn Along folks! Happy Wednesday! Walden is on my list to read this year. But next up (in terms of classics) for me is Pilgrim's Progress. I should mention that I have "The Well Educated Mind: A Guide to the Classical Education You Never Had" by Susan Wise Bauer to guide me through this journey of reading the classics. She gives a reading list with summaries of each book and even which edition is best to read. Also...I used to have a pair of fingerless gloves and loved them. They were the kind that had the flip part where you could cover your fingers if extra warmth was needed. I keep looking at new ones in the store and Kevin keeps telling me how pointless they are. But I know from experience that I really liked them - especially for the every day kind of getting out. I love fingerless gloves, they are very warm. Fingerless mitts are great for having a little extra dexterity when trying to do anything, but I do have to tuck my fingertips in if it is really cold! I think fingerless gloves are brilliant for fall and spring. In the dead of winter I like gloves over my gloves. I very much like the colour you are using. Fabulous!